Aquariums are complex aquatic habitats for many types of fish. Here are a few “tech tips” for you to get the most out of your aquarium. Nitrogen in a fish tank can take several forms. The most toxic is ammonia (chemical formula NH3), a waste product excreted by your fish. Other forms are nitrite (NO2–), also toxic to fish, and nitrate (NO3–), which is not harmful to fish at low levels. Certain types of bacteria convert ammonia to nitrite, while others convert nitrite to nitrate. It is important to have these bacteria established in your aquarium to remove ammonia and nitrite before you add fish. The Nitrogen Cycle explains the process including options for getting ammonia and nitrite to safe levels. One way to check the ammonia level in your tank is to use a commercial test kit. These kits, available at pet stores and on-line, come with chemicals to add to a small sample of aquarium water. After the chemicals are added to a test tube, the aquarium water will change color indicating how much ammonia is present. Compare the color of your test sample to the chart provided with the kit. Other test kits use treated strips that you wet with water from the tank. The strips will change color based on the level of ammonia, and a color chart shows how much ammonia is in the aquarium. How much is too much ammonia? Although some fish are more tolerant of ammonia, the safe approach is to keep testing until your color matches the lowest level on the chart, ideally 0. As the cycle proceeds, ammonia may increase for the first week or so as the bacteria become established. After ammonia peaks, it may take a few more weeks to fall to zero. As your ammonia level falls, nitrite will be rising due to bacterial action. 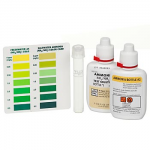 Nitrite test kits are similar to those for ammonia: add chemicals to a small sample of water and compare the color to a chart. Keep testing until nitrite levels reach zero. Depending on the temperature of your tank, it may take 3-4 weeks for nitrite to be converted to nitrate, which is safe for fish at low levels. Choosing aquarium lighting is a lot like selecting room lighting: your choice depends on your personal taste and what you have in the tank. An aquarium with only fish will feature different lighting than a reef tank with corals. 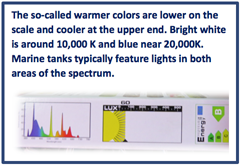 Some things to consider in choosing lighting for your tank are energy efficiency (a function of wattage), brightness (lumens), and color spectrum (a variety of light wave lengths essential for coral growth) measured on the Kelvin scale. In the past marine tank lighting was measured in watts, with 4 -6 watts per gallon typical for most tanks. With the advances in energy efficient lighting, aquarium owners now look for output and intensity of the bulb (or bulbs). 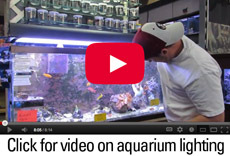 Fluorescent lighting is still the standard for aquaria, although LED is now an option. Fluorescent tubes come in lengths from 12 inches to 5 feet to illuminate most every aquarium option. A typical starter kit will have a single T8 wide-spectrum bulb. A step up from that is a T5 kit, a more energy efficient light (lower wattage) with increased brightness and a comparable color spectrum. For a 55-gallon marine tank, a good choice is dual 48-inch T5 bulbs, one with primarily white and yellow light (10,000 K) for illumination and coral growth and a second actinic bulb (20,000K) alongside to accentuate the color of your tank inhabitants. For a fish-only aquarium, growth is not an issue, so your lighting choice will likely depend on the overall brightness of the room and what fish you have chosen for the tank. You may want to hold off on buying your lights until you have made your fish selections and whether you want to have coral or other invertebrates. LED lighting is a relative newcomer as a marine aquarium lighting option. LED lights feature a series of low wattage diodes emitting light at different points on the spectrum. Although individual diodes output a narrow spectrum, LED hoods have diodes with different Kelvin ratings, allowing the aquarium owner to customize the tank’s appearance using a remote control. LED lights’ chief advantage is energy efficiency and long life. For comparison, you will likely need to change a fluorescent bulb every year, where an LED tank light may last for 10 years. LED lighting is more expensive than fluorescent, but your long-term cost savings may be worth it (see the light comparison box below). Thanks to Jerry Peterson of Carol’s Critters, Tallahassee for his help with this tip. Properly diagnosing and treating pathogens in tropical saltwater fish is difficult for hobbyists. Adding drugs to your tank without a diagnostic work up is not advised because many drugs have undesirable side effects and can adversely affect water quality. The beginning marine aquarium owner is best served by consulting a fish health specialist to diagnose the disease and recommend the proper treatment. Contact your state’s veterinary medical association; for Florida’s Association, click here. Locate a veterinarian in your area who works with exotic animals, such as reptiles; they often have an interest in fish, as well. Contact a university with a veterinary school or local public aquarium for assistance in locating one. 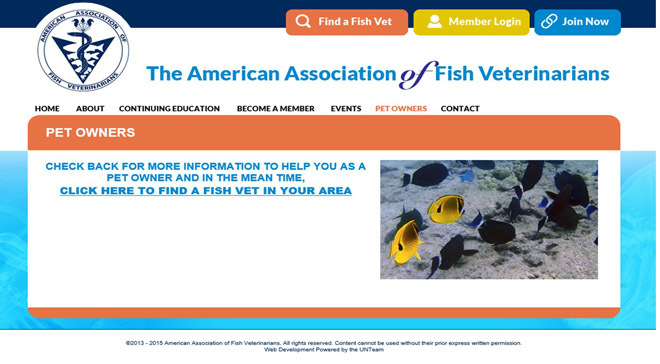 A newly formed organization, the American Association of Fish Veterinarians is developing information for pet owners including a search function on their website. This site is in its early stages and will be adding information in the near future. A saltwater aquarium is a mini-replica of a marine ecosystem, but without the natural cleansing that maintains good water quality in a large reef or bay. Keeping marine fish healthy in an artificial environment requires filtering the water to prevent the build-up of harmful compounds from fish waste or uneaten food (ammonia, nitrite, carbon dioxide), to keep the pH (acidity) in the proper range, and to have adequate dissolved oxygen while making sure carbon dioxide levels remain low. Beyond keeping your fish healthy, a good filtration system is essential to remove undesirable chemicals and compounds that lead to cloudy water or undesirable odor. A properly cycled tank will have bacteria present to convert very toxic ammonia to nitrite, and less toxic nitrite to nitrate, which is safe at levels found in most situations. One of the most effective methods of biological filtration in a marine tank comes from the use of live rock. Good live rock is extremely porous, containing a large amount of surface area for beneficial bacteria to colonize. For heavily loaded tanks, most filters have additional special media in the form of pebbles, beads, rings, tubes or plates manufactured to include many pores and crevices to increase their area available for bacterial colonization. Because biological filtration is dependent on robust colonies of beneficial bacteria, it is important that you don’t aggressively clean or sterilize any of these filtration media. Doing so will kill a large proportion of your beneficial bacteria, leading to “spikes” in your ammonia and nitrite. Basically, this a physical barrier that traps particles of waste and uneaten food as they are pumped through a filter. Depending on the specific filter being used, mechanical filtration may take the form of screens, netting, sponges, or some other similar material. Mechanical filters come with different pore sizes to trap the different sizes of solids in the aquarium. Because this is a mechanical process, the trapped material is not immediately broken down and the mechanical filters must be cleaned regularly before they have a chance to decay and further pollute the water. Many filters include a form of carbon that attaches to chemicals in the water, which can remove undesirable odors and keep the water clear. Synthetic materials also work like carbon, providing surface area for the attachment of unwanted elements. Other chemical filters function like magnets, attracting organic compounds, ammonia and nitrite. Specialized filters remove phosphate from aquarium water; phosphate can lead to excess algae growth. Foam fractionaters, also known as protein skimmers, create a stream of tiny bubbles that chemically attract very small particles (including proteins), with the waste deposited in a collection tube or chamber. It is important to remember that all chemical filtration methods have a limit on how much they can absorb or hold onto, so you should replace your media on a regular basis in order to continue having effective filtration. Adapting technology used by professional fish culturists, “fluidized bed filters” combine elements of chemical and biological filtration. These filters feature sand or beads that are suspended by flowing water. The beads provide a large surface area for the attachment of undesirable elements in the water as well as encouraging the growth of bacteria that break down ammonia. For professional aquaculturists, providing a proper diet is an exacting science where one size does not fit all. Feeding the assortment of fish in the Florida Aquarium’s Coral Reef exhibit requires knowledge of the nutritional requirements for carnivorous, omnivorous and herbivorous species. Tropical fish farms in Florida have similar challenges in meeting the dietary needs of large numbers of fish in small ponds and tanks. Fortunately, the science of marine fish nutrition has resulted in readily available quality feeds for aquarium species. New tank owners need to answer only a few questions to meet their needs. 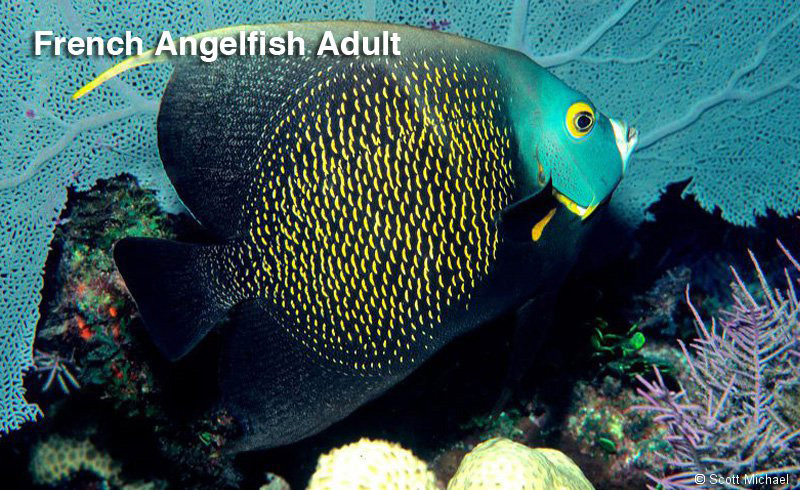 These two categories of marine aquarium fish featured in our Buyers Guide require different diets. 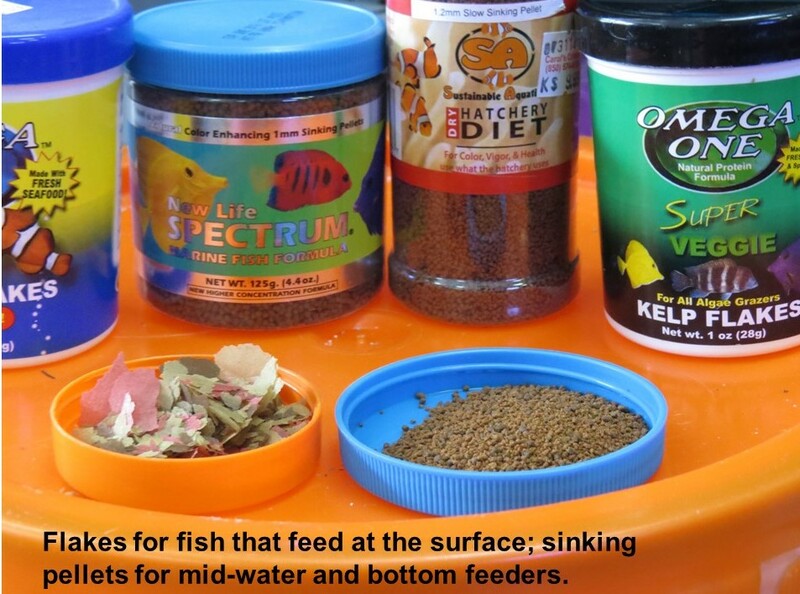 Carnivore feed features an assortment of marine invertebrates (such as krill, brine shrimp, mysis shrimp, and bloodworms), occasionally mixed with fish meal. Omnivore diets feature many of the same carnivore foods along with vegetable matter, often in the form of algae (Spirulina algae is often a component of omnivore foods). 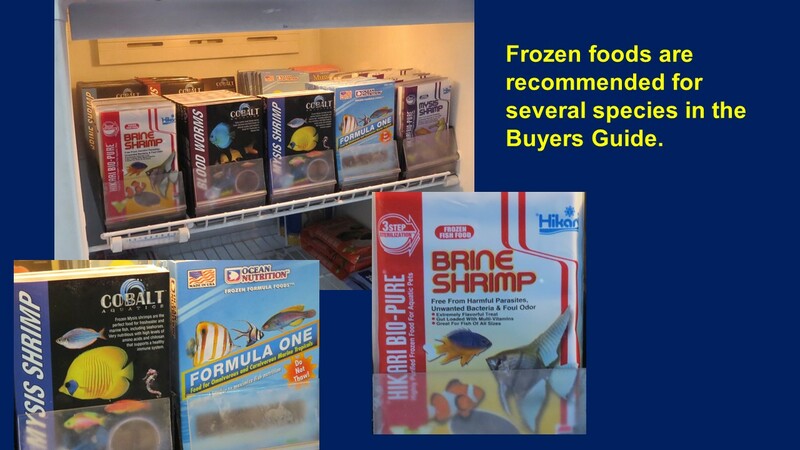 Frozen foods are preferred by some species, particularly for finicky eaters. 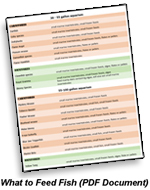 Refer to a list of the featured fish from our Buyer’s Guide, sorted by tank size and species’ diet, at the end of this Tip. For species that feed at the surface, choose either a floating pellet or a flake food. Bottom-feeding fish and species that feed in mid-water may require a pelleted version that sinks slowly. Feeding the right amount is important to provide nutrition in the form of proteins, vitamins, minerals and energy. Professional aquaculturists feed their fish daily based on the total weight of fish in a pond or tank (generally from 1-3% daily, depending on how old the fish are). The home tank owner can use a simple rule of thumb: feed what the fish readily consume within a few minutes. The amount of food will vary with the number of fish you have in your tank, and it will probably take some trial-and-error to determine the right amount. Overfeeding can cause water quality problems in your tank, including increased ammonia and lower dissolved oxygen, which can be harmful to fish (see Saltwater Aquarium Fish Health and the Nitrogen Cycle for more information). If you are using sinking pellets, take care to make sure that almost all the food is consumed to minimize the pellets that “get lost” in the bottom of tank. The frequency of feeding your fish is less important than how much they are fed. Many tropical species feed throughout the day in their natural environment, but tank fish do well eating less frequently. Ideally, your fish should be fed at least once daily, although some tank owners will feed twice daily or more often. Regardless of how often your fish eat, pay close attention to make sure that almost all the food is consumed to avoid water quality problems. 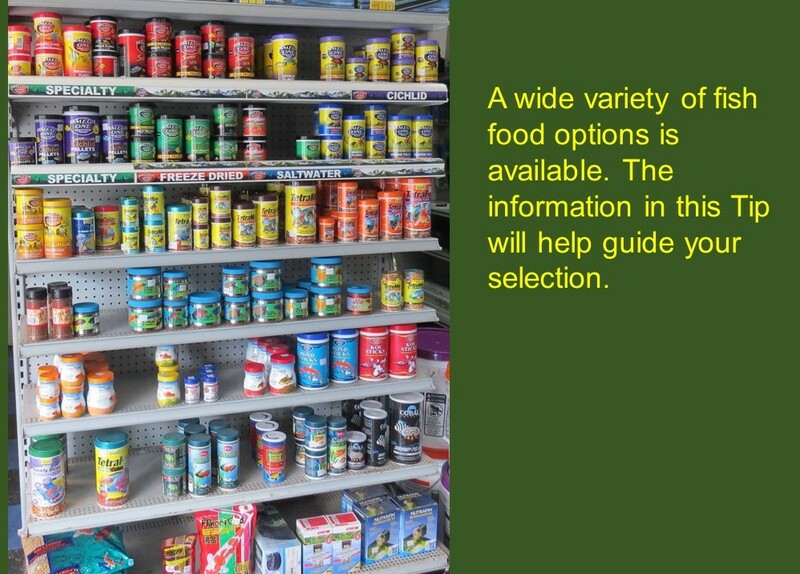 What is the shelf life of fish food? Freeze-dried flakes and pellets retain their nutritional value for about three years. Many packages will list the expiration date. Avoid thawing and re-freezing which degrades the food value.